When I initially learned about the issue of over-consumption, plastic, and overall waste, I decided to make a change, and the first place I started was by changing some of my bathroom habits! Why it’s sustainable: Unlike plastic toothbrushes, bamboo toothbrushes are biodegradable and compostable, which means instead of ending up in a landfill or the ocean, it’s providing nourishment to the earth. Where to buy: I use this brand – it’s a 12 pack for $10.50! Why it’s sustainable: Unbleached and unscented toilet paper, such as Bamboo toilet paper, is free of dangerous chemicals that are found in those super soft triple-ply TPs. Besides, I don’t really want to wipe my booty with chemicals anyway?? That’s just too close for comfort. How to dispose: Flush it down the toilet! It’s biodegradable! Why it’s sustainable: Before I switched to cotton rounds, I was ALWAYS buying cotton balls. Not only is the package of cotton balls wasteful & non-recyclable, the average person buys non-organic cotton balls, and cotton is one of the largest pesticide-using crops out there! By using reusable rounds, you not only save a bunch of money, you don’t contribute to the pollution & waste ordeal! How to dispose: Keep using it until it’s no longer usable! At that point, it’s biodegradable. Wash it thoroughly before composting! 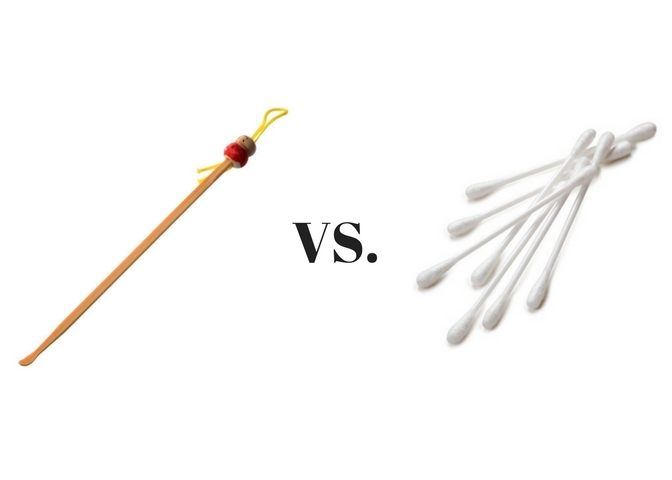 Why it’s sustainable: Q-Tips are similar to Cotton balls in my opinion – wasteful packaging & unsustainable origins. Q-tips aren’t recyclable which means they’ll end up in a landfill somewhere. Bamboo (or stainless steel) ear picks, on the other hand, will last a lifetime which makes them really sustainable. You can keep reusing it pretty much for ever and all eternity, and it’s oddly satisfying to have someone clean your ears for you… LOL DON’T JUDGE ME. How to dispose: I mean, this thing should last for forever, but if you need to dispose of it, the bamboo ear picks are biodegradable (as long as it’s not coated in weird chemical wax stuff), and the stainless steel picks are recyclable. Why it’s sustainable: Plastic razors, even the reusable ones, are still wasteful because you constantly have to buy new razor heads to replace them. The razor head is not recyclable in most curbside recycling, and eventually the plastic razor itself gets nasty & tossed in the trash. Those razor head replacements are also insanely pricey. Safety razors will last forever, and the razor head replacements are only about $5 for a pack of 10 razor head replacements… like, whaaat. That’s so cheap! How to dispose: Once you need to change the razor head for the safety razor, place the used bade back into the original container it came in, and when it’s full, ship it back to the company – they’ll recycle it for you. Check out this razor brand and recycling program. Where to buy: Get the razor from Amazon and the razor head replacements from the Van Der Hagen Recycling Program (for free). Why it’s sustainable: It’s more affordable and you don’t have to deal with the plastic packaging! How to use: Just like Poo Pourri, spray several sprays on the water before you poo, and the essential oils trap the bad smells in & release the good, essential oil smells. How to make: I’ve been using this recipe! It’s really easy. Why it’s sustainable: No packaging & all natural ingredients! Where to buy: Whole Foods, Natural Grocers, or pretty much any natural grocery store or farmers market around you! Why it’s sustainable: No packaging and no-poo ingredients! How to dispose: Same as bar soap, it disposes of itself after continual use! Where to buy: Amazon, or other natural grocery stores! Alternate Option: I am lucky enough to live in a city with multiple zero-waste friendly stores, which happen to hold multiple brands of BULK shampoo and conditioner. I have been refilling my bottles at the bulk store instead of using shampoo & conditioner bars. Your city might have a bulk store too, so if it does, another zero waste option is to just refill your shampoo and conditioner bottles! Why it’s sustainable: Plastic Loofahs are not only questionably disgutsing, they’re not recyclable… You know what that means.. It’ll end up in the landfill. All natural bath sponges are biodegradable on the other hand Just make sure if you buy one, you get a genuine sponge and not a synthetic sponge made to appear like it’s a real sponge. How to dispose: Compost it! Why it’s sustainable: First of all, that REACH floss literally takes me back to 1996 hahaha. Anyway, dental lace is made with all natural silk, and it’s refillable so you don’t have to worry about packaging. Synthetic flosses are coated in harmful waxes, can’t be composted, and have wasteful packaging. How to dispose: After you use your silk floss, place it in your compost bin! Where to buy: ….Did you guess? Amazon I promise Amazon isn’t sponsoring this post, I just use them for everything LOL.